I bet anyone who plays GD always wondered about stats and skills of monsters that inhabit Cairn, but there was no way to view this data since there's no bestiary in the game itself. Well, now you have such opportunity. You are able to view the list of all monsters that are present in vanilla game as well as all of its current epxansions (Crucible is not included atm). The list of monsters can be filtered by monster name, race and type (hero, boss, etc. ), you can also sort the list. If a monster has specific conditions to spawn (e.g. only on ultimate difficulty or if player level is in a certain range), this info is appended to that monster name. If a monster has several phases, the name of the phases is appended to that monster name. Currently on the monster page you can see 2 panels: to the left you'll see the familiar char sheet panel which was used to simplify the UI (well, you should be used to char sheet anyways) and to the right is the the panel where you can switch between the list of skills that monster has, the areas where it spawns and notable loot if it has any. You can select monster level and difficulty (which determines penalties/adjustments to monster stats). Just like in the calc, you can toggle monster buffs if needed. Monster equipment is NOT accounted for, because equipment is not static (well, sometimes it is, but it's an edge case), it depends on loot tables meaning that there might be hundreds of combinations. 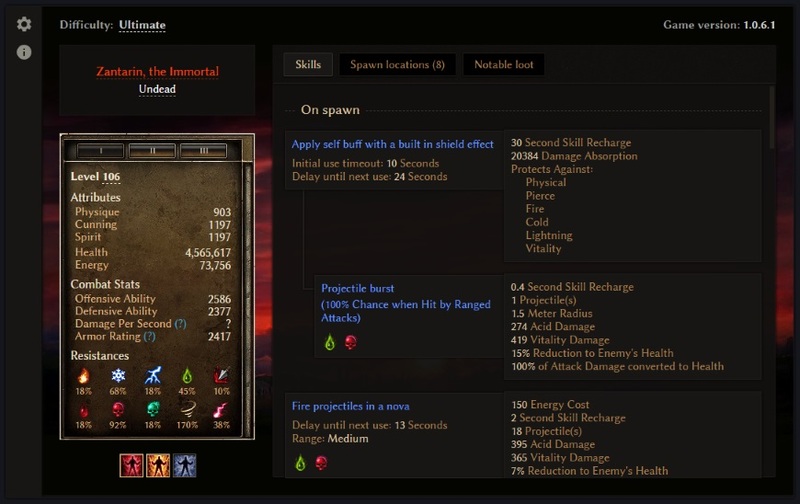 All skills are grouped into several sections (On spawn, On death, Attacks, Buffs, Heals and Passives). To the left you'll see the description of skill logic, e.g. "Single target spell" or "Debuff that spreads to nearby targets from the original target". The icons below indicate what damage type the skill deals, if it's an offensive skill or passive that provides flat damage — this way you can easily determine damage type at a glance. If the skill has special behavior defined, it is also listed on the left side, e.g. timeout before initial use, skill range, etc. To the right you'll see the skill stats. Most skills don't have names, so more often than not you won't see skill name and description there, only the stats. Some skills have autocast skills attached to them, in that case autocast skill is shifted to the right a bit and there's a line connecting it to the source skill. The skill stats that you see are not scaled by percent bonuses, so basically the logic is the same as in the calc. Monster loot depends on monster level, and the data you see there is tied to monster level that is currently selected. If the monster loot tables have thresholds when its loot drastically changes (usually it's new or higher tier items on higher levels), this will be indicated at the very top of the list. The list of items is split by loot tables, % to the left is the chance to roll specific table, % to the right is the resulting item drop chance. Certain monsters (currently these are only Loghorrean, Kra'vall and all Nemesis tier monsters) are tied to chests that unlock on monster death. And these chests also contain notable loot. However for now these aren't shown in the database 'cause it's not trivial to display corrent % chance for items, since they also depend on area level. Show spawn locations for all monsters. Add an ability to view notable loot (MIs, unique crafting items, e.g. Ancient Heart or Ugdenbloom). (?) Add non scalable player pets to the database. (?) Add a way to view monsters from Crucible. (?) Add an option to view scaled stats on skills. Last edited by Dammitt; 04-13-2019 at 10:27 AM.